All Web addresses mentioned were functional as of 5-5-17. From the Cumberland Gap to the Atlantic Ocean, this is Virginia Water Radio for the week of May 8, 2017. SOUNDS – ~12 sec - stream riffle in Montgomery County, Va., 7/1314; James River rapids at Richmond, 2/17/14; waves on shore of Claytor Lake in Pulaski County, Va., 9/30/12. This week, those sounds of a riffle in a stream, rapids in a large river, and waves on a lake shore set a habitats stage for learning about a diverse and unusual group of aquatic insects. Have a listen for about 15 seconds to a series of mystery names, and see if you can guess this insect group. Females: Little Stout Crawler! Spiny Crawler! Females: Small Minnow! Primitive Minnow! If you guessed mayflies, you’re right! You’ve been listening to the names of 13 kinds of mayflies, part of the over 670 species found in North America. The names were shouted out by students from Patrick County High School, located in Stuart, Virginia, during a visit to Virginia Tech on March 31, 2017. Scientists categorize insects into about 30 large groups known as orders; the order of mayflies is called Ephemeroptera, based on the Greek word ephemeros, meaning “lasts only a day.” That name refers to the very short adult phase of a mayfly’s life cycle—typically about 24 hours, just long enough to find mates and reproduce. The mating occurs in large swarms of adults emerging simultaneously—swarms so large along big rivers like the Mississippi that they’ve been known to cover roadways and bridges. For many species, the mating swarms occur around the month of May, giving mayflies their common name. Before this short adult phase, mayflies live as aquatic larvae (also called nymphs in this insect order); for most species, this phase lasts a few months. 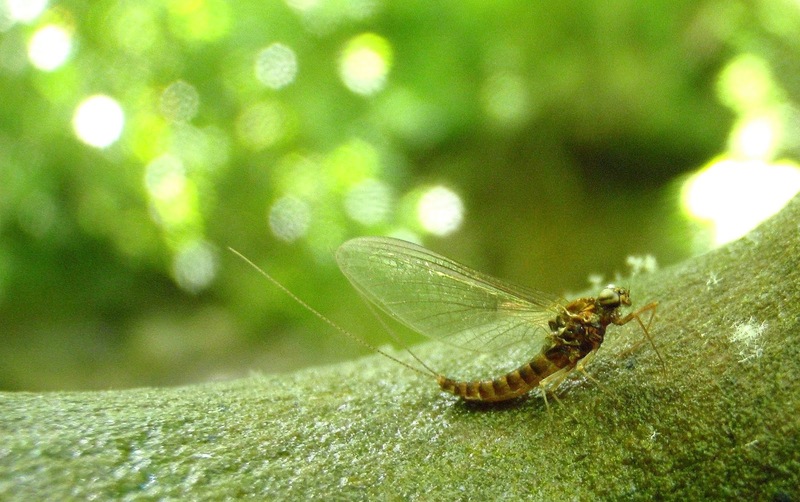 As a group, mayfly larvae live in practically any freshwater habitat you can imagine. Most species prefer stones, wood, or other materials in fast-flowing water, but others prefer slower water or even the relatively still water of lakes or ponds. In these habitats, mayflies are important parts of food webs, eating organic debris or algae and in turn being eaten by fish and many other predators. Their role as prey for game fish makes mayflies a popular model for fly-fishing lures. And the diversity and abundance of mayflies in many aquatic habitats make them valuable for biological monitoring of water quality. Variety; enormous mating swarms; ecological importance; angling fame—there’s a lot to discover about...[GUEST VOICES] mayflies! Thanks to Patrick County High School students and the school’s Dan River Basin Association Club for lending their voices to this episode. The guest voices in this episode were students from Patrick County High School, located in Stuart, Virginia, recorded on a visit to the Virginia Tech College of Natural Resources and Environment on March 31, 2017. Thanks to the students, the school’s Dan River Basin Association Club, school faculty Stephen Henderson and Brenda Martin, and the Dan River Basin Association’s Wayne Kirkpatrick for their visit and participation in this episode. Thanks to Michael Martz for the recording of the James River at Richmond in February 2014. Adult mayfly photographed in Lee County, Va., May 2010. Photo by Tony Timpano, used with permission. Flatheaded mayfly larvae. Photograph of drawing by Amy Bartlett Wright, part of “America’s Aquatic Insects—Indicators of Stream Health,” a poster published by Virginia Cooperative Extension (Pub. #420-710), not dated. 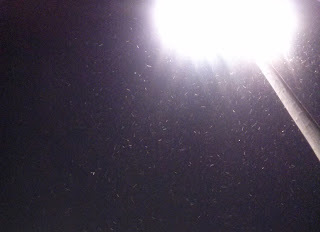 Adult mayflies swarming around a ballfield light in Shawsville, Va. (Montgomery County), May 12, 2014. Amateur Entomologists’ Society, online at https://www.amentsoc.org/insects/. Iowa State University Department of Entomology, “BugGuide/Order Ephemeroptera,” online at http://bugguide.net/node/view/78/bgpage. R. W. Merritt and K. W. Cummins, An Introduction to the Aquatic Insects of North America, 2nd Edition, Kendall/Hunt, Dubuque, Ia., 1984. Oxford Dictionary and Thesaurus/American Edition, Oxford University Press, New York, N.Y., 1996. J. Reese Voshell, Jr., A Guide to Common Freshwater Invertebrates of North America, McDonald and Woodward, Blacksburg, Va., 2002. University of Florida Department of Entomology, http://www.entnemdept.ufl.edu/choate/insect_orders.htm. Sarah Engel, “Bottom-dwellers Tell Stories about the Water Above,” Virginia Water Central, April-June 2002, pages 11-17, Virginia Water Resources Research Center, Blacksburg, online at https://vtechworks.lib.vt.edu/handle/10919/49327. W. Patrick McCafferty, Aquatic Entomology: The Fishermen's and Ecologists' Illustrated Guide to Insects and Their Relatives, Jones and Bartlett Publishers, Toronto, 1998; available for order online at https://books.google.com/books?id=wiTq7x-fI_0C&source=gbs_navlinks_s. University of Florida Department of Entomology, “Featured Creatures” Web site, http://entnemdept.ufl.edu/creatures/. All Water Radio episodes are listed by category at the Index link above (http://www.virginiawaterradio.org/p/index.html). See particularly the “Insects” and “Invertebrates Other Than Insects” subject categories. Episode 363, 4/10/17 – on aquatic macroinvertebrates generally. Episode 325, 7/18/16 – on Chesapeake Bay submerged aquatic vegetation. Episode 363, 4/10/17 – on aquatic macroinvertebrates (featuring the same Patrick County High School students heard in this episode). LS.4 - organisms’ classification based on features.